Dividends are a tax efficient means of withdrawing profit from your business. A dividend is a payment made by a corporation to its shareholders. Dividends are paid out of company profits, which the company has already paid or is due to pay Corporation Tax on. Using inniAccounts it’s straightforward to make an informed decision about your dividend payments. Before processing any dividends it’s important that your records are up to date, particularly personally incurred expenses and your bookkeeping. If your records are not complete then the LiveCash calculations will not be accurate and profit / cash available figures may be overstated. To create a dividend select the Withdrawals area, followed by Dividends. Finally, select the Issue dividend button. On this screen you will be shown two figures – Profit available and Cash available. Profit available – this figure is the amount of profit that is technically available to be paid out as a dividend. This figure is based on your company’s profit and loss figures for the current year. You should never draw more than this figure as a dividend. Cash available – this figure is based on the LiveCash view of your companies finances and shows how much cash you actually have available to pay a dividend. It is normal for these two figures to be different – often the Profit available is greater than the Cash available. The most common cause is that invoices that you have created, but not yet received payment for, count towards your available profit, but not your available cash. You can also click on the magnify icon to explore the details behind the profit you have available. You can enter a figure in the Amount to pay box – the dividend will be split between shareholders according to the number of shares they hold. Remember, you need to hold a director’s meeting and produce minutes documenting the dividend payment decision. You can find more information on how to appropriately document and pay dividends here. 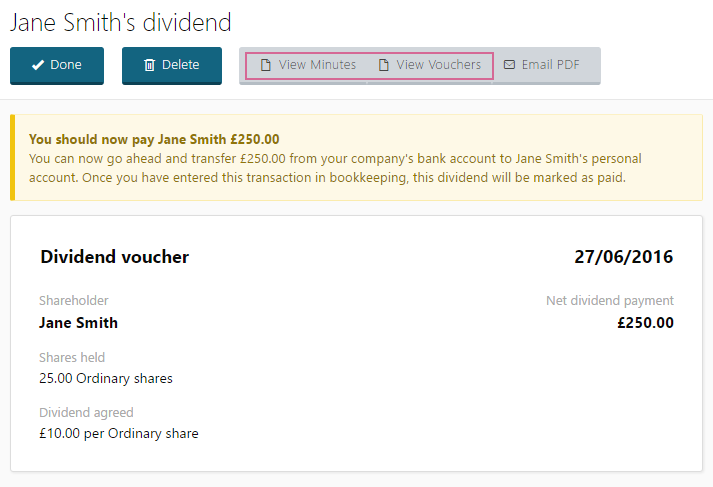 Once you have created and saved your dividend, select each shareholder to download and print minutes documenting the dividend agreement (this is a stipulation of running a limited company) and also download dividend vouchers detailing the payment and the tax credit available. You can now make the payment to the shareholders – you will find a pending payment in the Bookkeeping area for each shareholder’s payment.